Tidioute Cemetery, with a very impressive soldier's monument, is a large active cemetery located in the village of Tidioute. 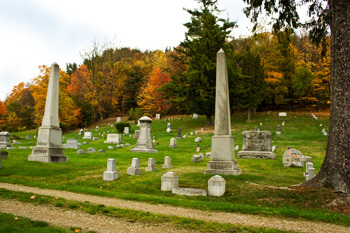 The grounds are well maintained, but most of this cemetery is on a fairly steep hillside. Sturdy shoes are recommended if you are planning to walk. There are no signs to direct you to this cemetery and it's not easy to spot from the road unless you know where it's located. Driving directions from the Hickory Street bridge in Warren (about 23 miles; 35 minutes): go west on Pennsylvania Ave W/US-6 (business route) along the Allegheny River. US Hwy 62 will join with US 6 before you leave Warren and the highways will become a free-access 4-lane. Drive through Starbrick and continue west. Merge south, following US-62 toward Tidioute/Tionesta (at this point US 6 will continue west to Youngsville). In approximately 16 miles through beautiful countryside along the Allegheny River, turn right onto Route 127 and cross the bridge into Tidioute. At the T-intersection, turn right onto Main Street and drive through downtown. Once in the residential section, look for the tall brick Methodist Church on your right. On your left is Economy Street. Turn left and drive up the hill. Turn right on Second Street and in one short block you will come to the entrance to the cemetery (see above photo). There are several gravel roads that wind through the grounds. Some are quite steep with very few places to turn around. The second entrance/exit is on Third Street, one block above Second Street. The easiest way to navigate the cemetery is to simply drive all the way on the gravel road you have chosen to the Third Street entrance/exit. 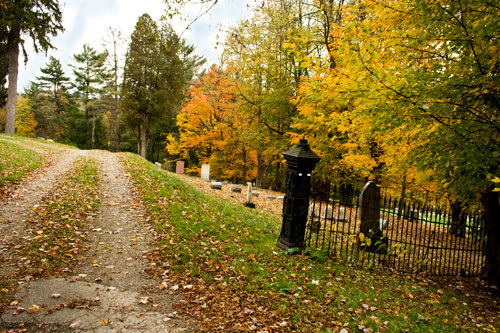 Then either return to the Second Street entrance and select the other gravel road to make another pass through the cemetery OR turn around at the Third Street entrance and drive back through the grounds via a different route. It make take three or four passes through the cemetery before you have a good command of the layout and roads. Downtown Tidioute on the Allegheny River is located below the houses on the right. 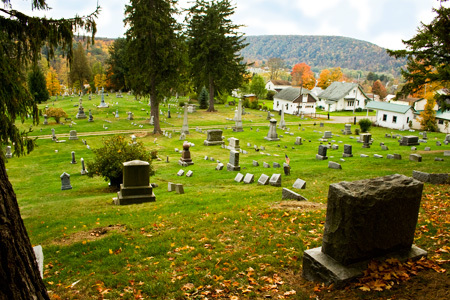 Over 2,800 burials are listed on Find-A-Grave - Tidioute Cemetery, many with photographs of the gravestones. Names of soldiers can also be found with information about the soldier's monument. Died in Tidioute, Thursday evening, June 6th 1901, Dr. James L. Acomb; aged 73 years, 3 months and 10 days. Dr. Acomb was born at Stanford Bridge, Yorkshire, England, February 27, 1828, the son of Joseph and Elizabeth Acomb. When the Doctor was five years old his parents came to this country, going first to Geneva, NY and later to Dansville, where his father engaged in farming, dying of cholera in 1834, leaving a widow and four children, James being next the oldest. He left home and by close application secured a medical education, graduating from Syracuse Eclectic Medical College in 1853. He located in Cuba, NY, remaining sixteen years, and then came to Pithole, removing therefrom in 1866 to his permanent home in Tidioute. He at once took a prominent part in Boro affairs, being Burgess, Councilman, School Director, etc., at different periods; built up a large practice in the surrounding country, which he held until his disabilities incapacitated him for his country rides; enjoying a heavy trade in the drug store, which he still owned at the time of his death. He also was engaged in oil development, in which he made money. He joined Temple Lodge, F. and A. M., advancing in the different masonic degrees to the 32nd. Also became a member of Eden Lodge and Home Encampment, I. O. O. F. In 1852 he married Miss Seraph Oliver of Steuben county, NY. To this union were born six children, the only surviving being Seraph May, wife of Prof. C. M. Knight of Akron, OH, and Lillian T., wife of L. L. Hunter. Dr. Acomb was a man of decided opinions on any subject, and never hesitated to express them when occasion required. He was firm in his beliefs and followed them to a finality. He was a good citizen and beneath an of time rough manner he carried a warm and confiding heart that ever stood ready to do its part in alleviating distress or misery, and at his funeral were gathered many who bore willing testimony to his worth. The funeral was held Saturday afternoon from his home church, St. Paul's Universalist, and was in charge of Temple Lodge, 412, F. and A. M. The sermon was delivered by old time friend, Dr. O. Cone, President of St. Lawrence University, Canton, NY, under a promise made years ago. It was not a sermon of laudation or extravagant encomium, but simply in eloquent words evidenced the acquaintance and friendship existing between two men grown gray with the years, and who knew each other thoroughly. The internment was in Tidioute cemetery, under the shadow of a life size statue of the Doctor erected by himself a number of years ago, and the beautiful Masonic ceremonies were listened to by a large audience. And there beneath the blue sky, with a mound covered with handsome flowers, lies Dr. Jas. L. Acomb until that morning when time shall be no more. The Doctor was sick only a little over a week, erysipelas developing and becoming complicated with heart trouble. A post mortem developed not only valvular heart trouble, but kidney trouble as well, and while the cause of his death was erysipelas, his other troubles prevented his recovery from the attack. Beside many of the Doctor's old patients at the funeral, were Frank Acomb of Danville, NY, a nephew, and J. G. Day also of Danville (Dansville, NY). There were also present from Warren Commandery Messrs. O. W. Beatty, Andrew Hertzel, W. C. Watson, Willis Cowan and George F. Yates. Source: Tidioute newspaper "The News" dated June 14, 1901. LINK to James L. Acomb biography. Marcus Douglas Day passed away at his home in Tidioute, Wednesday morning at 9 o'clock, after an illness of several weeks, of blood poison. He was born in Ashford, Cattaraugus county, N.Y., February 14, 1842, and at the time of his death was 76 years old. He was married to Mary Jane McIntyre at Great Valley, N.Y., July 8, 1867. 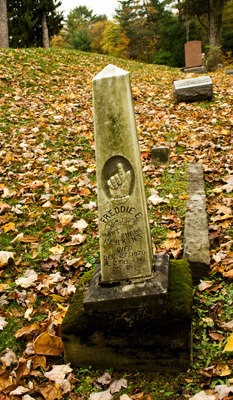 He was a veteran of the Civil war, being a member of Co. K. 116th regiment. He is survived by his widow, one daughter and five sons, as follows: Mrs. Peter Nolan, Jamestown, N.Y.; Charles Henry, of Corry; Sheldon, Clark, Claude and Elmer, all of Tidioute. Twenty-five grandchildren and seven great-grandchildren also survive. The funeral services were held Friday afternoon at 2:30 and the interment was in the Tidioute cemetery. Favorite hymns of the deceased were sung at the funeral, among which were "Rock of Ages," "Some Day We'll Understand," and "Nearer My God to Thee." Ashford (N.Y.) papers please copy. Source: Warren Evening Times, Saturday, April 13, 1918 edition. The late Thomas F. Downey was born at Fagundus January 7, 1884, and was a son of Dennis and Charlotte (Plunket) Downey. He grew to manhood in that neighborhood and was an oil well worker in early life He was united in marriage to Miss Belle Range of Stewart Run December 5, 1905, and there were four children born to them, Frank J., 15, Margaret, Thelma, and Edna, the youngest being 10 years old. He moved his family to this place four years ago and was employed by the South Penn Oil company, gasoline department, in charge of the plant here. It was in the discharge of his duty he met his death on Saturday, February 3, 1923, by injury and suffocation while loading a car of gasoline at this place. He is survived by two brothers, William and Charles, of Tidioute, seven sisters, Mrs. May McCarthy, Mrs. Elizabeth Vrooman, of Tidioute, Miss Alice Downey of Pleasantville; Mrs. Nellie Baker, North East; Mrs. Julia McGraw, Mrs. Katherine Peterson, Fagundus; and Mrs. Viola Vrooman, West Hickory. The body was taken from here to Tidioute on Monday and was interred in the Tidioute cemetery on Tuesday afternoon. By his demise our community loses a good citizen, the South Penn Oil Co. a trusty employee and the people a good friend and neighbor who had a hand in all good movements and was kind to his family and fellowmen. The entire community extended to the bereaved family a helping hand and heartfelt sympathy in their hour of sorrow, which came so suddenly to our little village.—O. E. Rupert. Source: Newspaper clipping from the Tionesta Library, Tionesta, Forest County,PA. Pearl Green Downey, wife of William Downey, passed away at 7:15 o’clock Tuesday morning, March 5, 1940, at the family home, 67 Main st., Tidioute, following a short illness. The daughter of James and Cynthia Green, she was born June 8, 1879, at East Hickory. She was a member of the Woman’s Benefit Asociation [sic], Review No. 55, and of the Lady Jane Rebekah Lodge, No. 441. Besides her husband, she leaves the following to mourn her passing: Two sons and four daughters, Gordon and Guy Downey, Tidioute; Mrs. Grace McKown and Mrs. Gertrude Babcock, Warren; Mrs. Hazel Fuellhart, Pittsburgh; Miss Helen Downey, at home; also three sisters and four brothers, Mrs. Bertha Beck, Pleasantville; Mrs. Anna Copeland, Tionesta; Miss Chloe Green, Herbert and Fred Green, West Hickory; Milton Green, Pico, Calif., and Herbert Green, in Oklahoma. Private funeral services will be held from the home at 2:30 o’clock Thursday afternoon, conducted by the Rev. E. Scott Byers, pastor of the First Presbyterian church. Interment will be made in the Tidioute cemetery. Friends are asked to kindly omit flowers. The funeral of William Downey, who died last Tuesday, was held from his home, 67 Main street, Tidioute, at 2:30 p.m. Friday, conducted by the Rev. H.A. Stevenson, retired Methodist minister of Tidioute. Interment followed in the family plot in Tidioute cemetery, with Maurice McCarthy, Robert Peterson, Duane Downey, George Tipton, Emmett McGraw and Floyd Baker as the bearers. Attending the rites from away were relatives and friends from Indiana, Pa., Titusville, Evans City, Pleasantville, Tionesta, West Hickory, North East, Erie and Warren. Source: April 7, 1952 edition of the Warren Times Mirror. TIDIOUTE--George B. McKown, aged 80 years, 7 mos, well-known veteran barber in Tidioute, died suddenly at his home on Tuesday, April 4 at 8:20 pm of a heart attack. He was born in Armstrong county, Oct 8, 1869. He resided at Nebraska, Forest County, for many years, prior to moving to Tidioute in 1916, where he engaged in the barber business. He was a member of the Macabee Lodge in Tidioute and the Methodist Church. He is survived by his wife, Ida M, a daughter, Mrs Edson Carnahan, and sons, Sherman B. of Sheffield, Walter R., H. Hobson and Glenn D. of Tidioute. The Sage Funeral Home is in charge of funeral arrangements and services will be held at the late home on April 7 at 2:30 pm with Rev. H. M. Stevenson officiating, with interment in the Tidioute Cemetery. 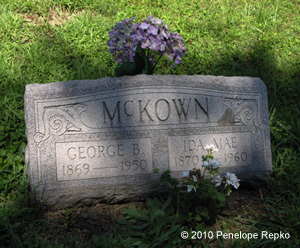 George B. McKown, born in Armstrong county on October 8, 1869, died at his home in Tidioute on April 4, aged 80 years. Rev. H.M. Stevenson, of the Methodist church, officiating. The many beautiful floral offerings testified to the high esteem in which he was held. Mrs. Martha Walter, Earl and Philmore Walter, Mrs. Florence Johnson, Gordon and Clyde Johnson, Mrs. Julia Rapp and daughter, Warren; Mr. and Mrs. Walter Myers, Mr. and Mrs. S. G. Bingham and son, Walter, Miss Margaret McChorley, Mrs. Susie Tock, Pittsburgh; Mrs. Florence Atwell, Clarendon; Charles Walter, Mr. and Mrs. J. Ross Walter, Mrs. Olive Wybinga, Saegertown; Mr. and Mrs. Charles Walter, Tionesta; Mr. and Mrs. Samuel Shrear and granddaughter, of Oil City; Mr. and Mrs. Sherman B. McKown, Mr. and Mrs. Elwood McKown, Mrs. George Porter, Sheffield; Mr. and Mrs. Harvey Lynch, Mrs. Miller, of Reno. In October, 1895, Mr. McKown was united in marriage with Ida Walter, who survives him, along with the following children: Mrs. Zora Carnahan, H. Hobson, Glenn D. and Walter R. McKown, Tidioute; Sherman B. McKown, Sheffield; with 12 grandchildren and seven great-grandchildren. George B. McKown, well known popular veteran barber at Tidioute died suddenly last evening about 8:20 two hours after he had been stricken with an acute heart attack. Mr. McKown was born in Armstrong county October 8, 1869, and had resided in Tidioute for the past 34 years. Prior to going to that place he had been a resident of Forest county. He retired from the barbering business about two years ago because of ill health. Surviving are his wife Ida, and the following children: Walter R., H. Hobson, Glenn D., and Mrs. Zora M. Carnahan, all of Tidioute; and Sherman B., of Sheffield. There are ten grandchildren and seven great-grandchildren. Mr. McKown was a member of the Maccabee Lodge in Tidioute, and attended the Methodist church. The Sage Funeral Home in Tidioute is in charge of arrangements for the services which will be announced later. Services were held at the home of Mrs. Mildred McCarthy in Tidioute at 2:30 p.m. Saturday, August 7, in memory of Emery Rosequist. Rev. H.M. Stevenson, pastor of the Methodist church, officiated and bearers for interment in Tidioute cemetery were Russell Peterson, Herman Brocklehurst, Donald Lang, Frank Randinelli [sic], Elmer Selander, and J. Rosequist. Among those attending from away were the following: Mrs. Florence McBride and daughters, Mabel and Audrey, Mr. and Mrs. John McBride and son, David, Mr. and Mrs. Kenneth McBride, Bradford; Mr. and Mrs. Lou Anthony and son, John, Cleveland, O.; Mr. and Mrs. Will Kaltenbach, Mr. and Mrs. Carl Anderson, Warren; Charles Rosequist, Mrs. Lynn Smith and daughter, Charlotte, Mr. and Mrs. John Harrington, Titusville. Source: Warren Times Mirror, Friday, August 13, 1948, page eight, column one. Contributions are always welcome by sending information to the Warren County coordinator.